Christmas would not be Christmas with lots of little spiced biscuits, and this is one that fits the bill perfectly. These are kruidnoten (“spice nuts”) or kruidnootjes (“little spice nuts”) from the Netherlands. 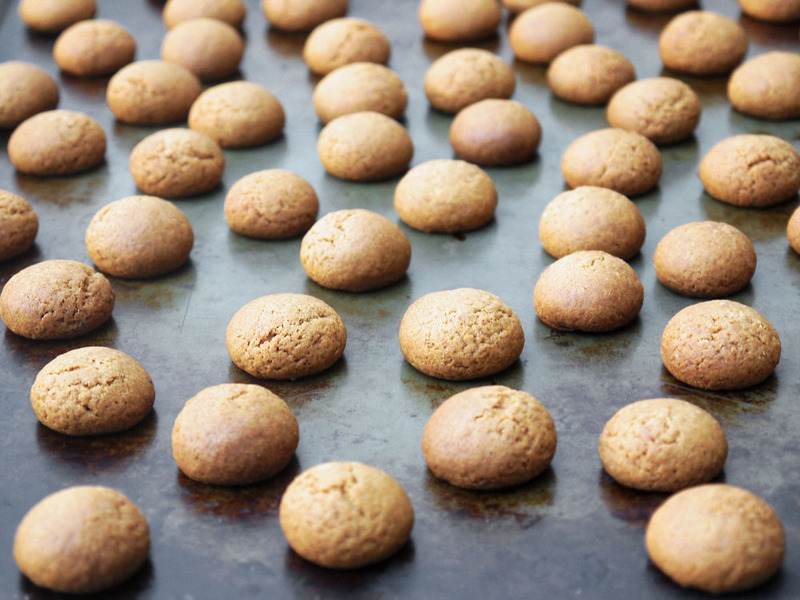 Kruidnoten are small, crunchy biscuits made with brown sugar and loaded with Christmas spices. They are also incredibly cute – they are actually tiny (less than a small cherry!) and are often given to children in bags, or poured into bowls to munch on while you’re enjoying the festivities. The good news is they are also incredibly easy to make, great if you’re in a hurry, don’t fancy tackling something too complex or need a quick home-made gift. You just have to whip up butter, sugar and a dash of syrup, then work in some spices and flour. The fun bit was shaping the kruidnoten. I cut the dough into four pieces, and rolled each into a long snake shape. Then (like the geek I am…) I used a ruler and a knife to cut equally-sized pieces, then rolled them into balls. That probably sounds like an unnecessary degree of obsession, but you know what? All the cookies ended up exactly the same size when they were baked, so I was left feeling rather pleased. Another real boon is that this is a good cookie choice to make with younger children as there are no complicated steps to follow and, critically, no raw eggs are involved. That means that if little fingers start to stuff the raw dough in their mouths, it will still be perfectly safe (even if the baking powder might not be the tastiest thing they’ve ever eaten). Cutting and rolling the dough into little balls is good fun, and the kruidnoten will cool quickly after baking. This means that little helpers can then eat the fruits of their labour quite quickly, preserving festive kitchen harmony. Now, you could just leave them as they are and end there. Or…there is one alternative. 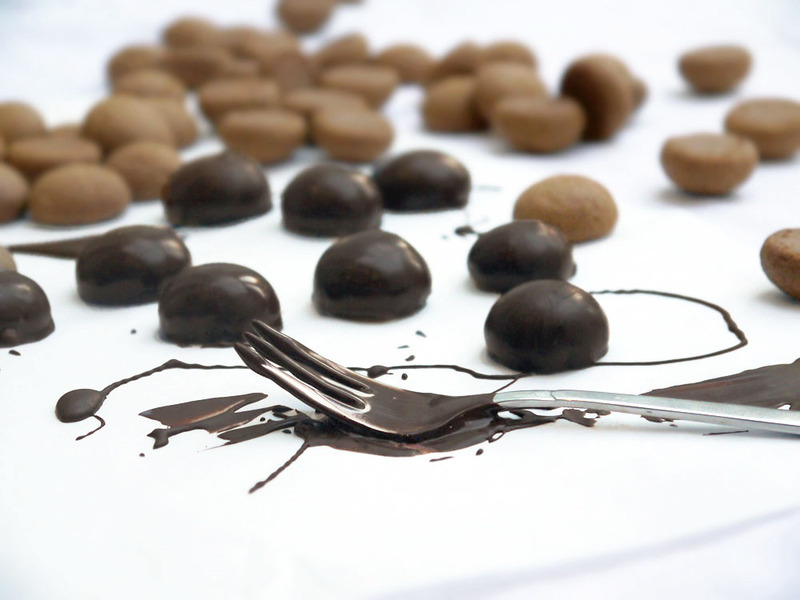 Dip ’em in dark chocolate. This is definitely not traditional, but I can promise you that this is utterly delicious. The dark chocolate works beautifully with the sweet, crunchy, spicy biscuit, and if they if you add salt to the cookies, this contrasts with the sweetness of the chocolate too. If you have tempered the chocolate properly, they also look really rather stunning when served alongside tea, coffee or hot chocolate. 1. Mix the flour, spice, pepper, baking powder and salt in a bowl. Put to one side. 2. In a separate bowl, cream the butter, sugar and syrup until soft and fluffy. Add the dry ingredients and mix well. Add enough milk until the mixture comes together (a tablespoon at a time – the dough should be soft, but not sticky). Wrap in cling film and chill for an hour or overnight. 3. Preheat the oven to 170°C (340°F). Double-line a baking tray with greaseproof paper. 4. Divide the dough into four pieces (mine weighed 271g, so I had 4 x 67g…I’m rather nerdy when it comes to measuring). Roll each piece into a long sausage and cut into 16 pieces (again…I rolled mine out until it was 32cm long, then put a ruler next to it and cut equal pieces of 2cm…). 5. Roll each piece of dough into a ball and place them on the baking sheet with a little space between them. You might have to bake them in two batches. 6. Bake the kruidnoten for around 14-16 minutes (turning the tray half-way) until slightly puffed and a spicy aroma comes from the oven. Remove the tray and put the kruidnoten on a rack. They should harden as they cool. 7. 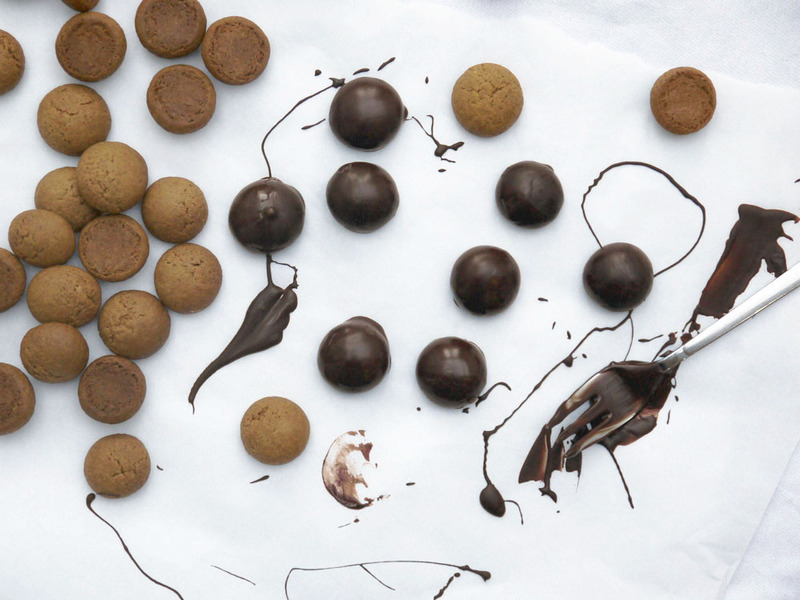 If you want to, dip the cooled kruidnoten in dark chocolate for a more indulgent festive treat. Worth making? A definate yes – very easy to make, and utterly delicious and more-ish. A true Dutch delight!